YFO is an accredited early care and education facility, admitting children from 6 weeks old to kindergarten. Both Executive Director Camelia Babson-Haley and Fred Dobson, insist their jobs do not simply involve the children who pass through their program but also their families. Camelia has been involved with Starting Strong since its inception. 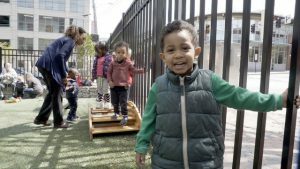 Her approach, one of collaboration between teachers, parents, and children, is a wonderful example of Starting Strong’s work to create a supportive community for early childhood development. “If we can start by creating for parents, a really positive experience with education right from the beginning, it’s going to help parents feel comfortable; because the education settings can feel very threatening,” says Camelia. Starting Strong aims to have all children be successful in school which includes a healthy, ready community that will raise engaged kids. Camelia and teachers like Fred are doing this work every day as they adapt their approaches to new needs they see. The food program at YFO is one key example of their efforts to best meet needs. Seven years ago the organization changed their approach to nutrition and now everything is made from scratch with whole ingredients, purchased locally. Camelia notes that nutrition has a huge impact on brain development, especially from birth to five when the brain is changing so rapidly. She sees this program as another chance to ensure the kids’ needs are being better met so they can be more engaged in learning. After spending just an hour at YFO, it is evident their passion to be at service to the Portland community by helping kids be their best, love learning, and return home to a positive environment. 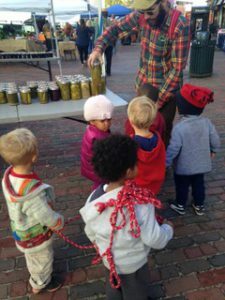 Entering Fred’s classroom, he is actively engaged with his 2.5 to 3.5 year olds, eating alongside them and participating with them in activities. As he says, “closer bonds can make it easier for everything to happen.” Fred sees each child as an individual whose needs are unique. This is why he loves the “whole book approach” for reading, so “every child can come at it from their own perspective, there is no right answer.” These techniques and evolving methods of childcare at YFO demonstrate an environment which fosters Starting Strong’s mission. The collaboration Starting Strong has created around early childhood education aims to help organizations like YFO to more efficiently serve children by being more. “We are all so busy off in our own worlds, it is isolating work. Starting Strong meetings help me stay current so I can bring information back to staff and families,” Camelia explains. Camelia’s passion to stay up to date and efficiently serve the kids at her organization is evident as she talks about her programs, staff, and the connection to Starting Strong. As Fred drew from an infamous quote, “It helps put the unity in community” which is what the partnership is all about. Thank you Youth and Family Outreach for serving our community so well and helping children be successful throughout their educational careers!